The Indian Art Market and associated programs are free and open to the public. Regular admission required to see full museum. 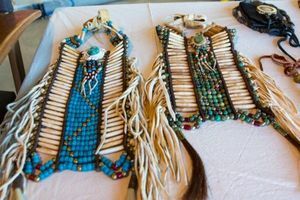 Shop for Native American art and jewelry at the Natural History Museum of Utah. The Indian Art Market is an annual juried show at NHMU featuring the top regional Native American artists. Jesse Johnson, two-time Best of Show winner in 2016 and 2017, is among the artists returning to NHMU for the 2018 Indian Art Market. Johnson, from Zuni Pueblo in New Mexico, is a skilled designer and crafter of authentic Zuni petite point jewelry.